abstract Sahi Pro v6.3.0 is a major release and contains many new features and bugfixes. Suite report will now be displayed as a nested tree structure. It shows the exact nested level for scripts the way it is written in suite / dd.csv file so that user can get the idea of which script belongs to which suite / dd.csv file. Offline reports will also look as nested tree structure. This has been described in detail here. If you upgrade to Sahi Pro v6.3.0, then older suite reports will be displayed in the older flat structure instead of the new tree structure. Syncing suite reports created in older versions of Sahi Pro to Sahi Pro v6.3.0, will display the older reports in flat structure. info IMPORTANT: For distributed run, we strongly recommand using Sahi Pro v6.3.0 on both master and slaves machines, so as to get desired suite report structure. info NOTE: The failed suite will contain all the failed scripts at the same level, so there will not be any tree structure in failed suite report. During script playback, a notification of the current suite status will now be shown. The notification would be updated when the status of a script changes. A summary of the number of Testcases and Scripts passed and the number of Testcases and Scripts ran will also be printed. When scripts are executed using a command prompt (which includes Testrunner, Drun, Drun Diff Master and Ant), the messages will be logged in their corresponding consoles. In the case of Editor, the notification will appear on the bottom right corner of the Editor screen. You can read more about these notifications here. A new Auto-Indentation button has been added in the Script Editor. When pressed, it will read the contents of the entire .sah script and correct its indentations and format. This improves readability, reduces efforts and brings all formatted scripts to the same pattern. Script formatting has been described in detail here. _assertHorizontallyAligned: Asserts if two elements are horizontally aligned. _assertVerticallyAligned: Asserts if two elements are vertically aligned. _assertCentered: Asserts if inner element is vertically or horizontally centered to the container element. _assertVisiblyInside: Asserts if an element is visibly inside another element. _assertVisiblyOutside: Asserts if an element is visibly outside another element. _assertVisiblyOn: Asserts if an element is placed on another element. _assertFitsWidth: Asserts if an element fits within the width of another element. _assertFitsHeight: Asserts if an element fits within the height of another element. _areHorizontallyAligned: Checks whether two elements are horizontally aligned or not. _areVerticallyAligned: Checks whether two elements are vertically aligned or not. _isCentered: Checks whether inner element is vertically or horizontally centered to the container element. _isVisiblyInside: Checks whether an element is visibly inside another element. _isVisiblyOutside: Checks whether an element is visibly outside another element. _isVisiblyOn: Checks whether an element is placed on another element. _fitsWidth: Checks whether an element fits within the width of another element. _fitsHeight: Checks whether an element fits within the height of another element. Updated Sahi certificate from SHA1 to SHA256. Change or add license server configurations. 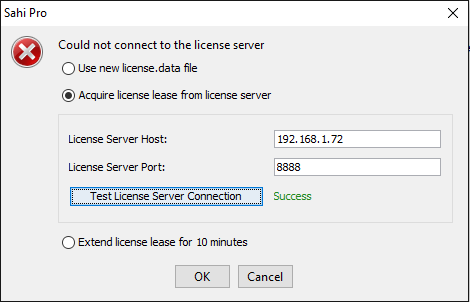 Or if one has ever acquired a lease from license server configurations provided in userdata.properties the one can extend the lease for 10 minutes for 3 times i.e total of 30 minutes. Fix for _launchNewBrowser. Object identification was failing in IE Quirks mode. Fix for _wait API in Excel Framework and Robot Framework. Fix for spaces in field name of _addToSuiteInfo. Controller - "Save AR" button now gets enabled on writing a new AR Key. Controller - Fixed opening of new recorded scripts with spaces in its file name (by clicking on "Script Editor" link in Controller). Fix for ShadowDOM identification in Firefox. Editor - Disabled closing of Playback properties (on clicking the 'Run' button) if fields are missing or Start URL is invalid. Editor - Fixed creation of function (without arguments) from the Sahi Editor. Editor - Fixed autofocus while creating, opening and saving scripts. Fix for trailing spaces in email.properties and sync_db.properties file.